How bad is the obesity epidemic? Bad enough that car makers are increasing the size of cars to accommodate our collective expansion – typical family cars have gained about a foot of width over than half a century ago. And in a Plump My Ride research initiative, at least one luxury automaker is researching how obesity affects mobility while driving. Liedman notes that this report suggests traditional wellness programs aren’t enough to tackle the issue of morbid obesity and employers should consider offering benefits that cover more dramatic interventions, such as bariatric surgery. We’ve previously discussed obesity costs as they relate to workers comp based on an NCCI study. While some might think that the suggestion for employers to consider benefits to cover bariatric surgery to be a radical response, it may be a Hobson’s choice of “pay for it now” or “pay for it (more) later.” We’ve pointed to several cases that determined employers must pay for weight reduction surgery as part of recovery from a work-related injury. See Compensable weight loss surgery? A new wrinkle in obesity and New York Weighs in on Obesity. Do you know your own BMI? Use this BMI calculator to check your own weight or to use in your wellness communications. Van R. Mayhall of Insurance Regulatory Law makes his debut as host of Cavalcade of Risk with his “Meet the Experts” edition. Mayhall is an expert himself – an attorney who practices in the areas of Business & Corporate Law and Insurance Regulatory Law. We welcome his participation! Workers Comp Conference – Nancy Grover offers a sneak peek at highlights of the National Workers’ Compensation and Disability Conference & Expo which is on the docket for November 9 and 10 in Las Vegas. You can follow more about upcoming conference events on LinkedIn’s National Workers’ Compensation and Disability Conference & Expo Group. Maximizing wellness program ROI – According to a post by Preston Diamond in Risk Management Monitor, “On average, employers can see a 30% reduction in Workers’ Compensation and disability claim costs, according to a review of 42 published studies involving the economic returns of wellness programs. Moreover, wellness programs will reduce the costs of absences that, according to the 2010 Kronos/Mercer Survey on the Total Financial Impact of Employee Absences, add up to 8.7% of payroll costs, more than half the cost of health care.” But experts caution that all wellness programs are not equal so employers need to implement with care. See 5 Steps Companies Should Take Before Launching a Wellness Program. Performance Standards & Disabilities – Employment law attorney Daniel Schwartz posts an FAQ on Applying Performance Standards to Employees with Disabilities. He notes that although the ADA affirms an employer’s right to define jobs and to evaluate employees according to consistently applied standards governing performance and conduct, it’s a case where the devil is in the details. But he links to some lesser-known EEOC guidance on the matter that helps to address some common questions. High costs of excessive alcohol consumption – According to a new study on the costs of excessive drinking by the Centers for Disease Control and Prevention, the cost of excessive alcohol consumption in the United States in 2006 reached $223.5 billion, which translates into about $1.90 per drink or $746 per person. Researchers also pointed out that 72% or the total costs could be attributed to losses in workplace productivity. Is Ohio drinking the tea? – Looking at some ballot issues in Ohio, Roberto Ceniceros asks if a tea party initiative could end workers’ comp. He cites a Toledo Blade editorial which argues that although the intent of the measure is to thwart the health-care reform law, it may open the door to some unintended consequences. A picture is worth a thousand words – The Geography of a Recession is an animated view of U.S. unemployment from 2007 to 2011. Hat tip to Workplace Prof Blog for the pointer. Lift Gates – Tony Jones of the MEMIC Safety Blog offers a good overview on safety considerations related to lift gates, including equipment considerations, pre-operations, operations, and special considerations. For 36 years Rodolfo Meza worked for Aerol Corporation in Rancho Diminguez CA as a metal worker making cast iron and aluminum molds. He was about 48 when he began working; he was about 84 when he was terminated while on medical leave for a knee operation. Rodolfo sued, claiming age discrimination, raising the question: how old is too old to work? When he was terminated in 2009, his 24 year old son (conceived when Rodolfo was 60!) noted that he became sad and depressed. A jury awarded Rodolfo $100,000 for future economic loss: based upon his annual earnings, that’s a little over three additional years of employment, bringing Rodolfo to age 87. In addition, they awarded $300,000 for past non-economic damages (presumably, the ongoing agist comments of his supervisor). That’s a lot of money for an individual nearly 20 years past the conventional retirement age. Aerol appealed and lost. The CA Court of Appeals found a pattern of discrimination, along with a legal technicality that prevented Aerol from contesting the award for the future earnings: Aerol failed to raise the issue in a timely manner during the initial the trial. Is the court saying that employers must continue to employ workers into their 80s, with no recourse available to force retirement? Can workers work as long as they like? Aerol – through the actions of Rodolfo’s supervisor – made a number of critical mistakes in managing this situation. The supervisor made repeated comments about Rodolfo’s age; the supervisor should have been warned to cease this behavior and disciplined if he continued. Rodolfo had an exemplary record of employment; there was no (written) indication that his performance had deteriorated. When Rodolfo felt less capable of doing his regular job and requested a transfer, he was denied the opportunity based solely upon his age. When he requested time off for the knee surgery, it was granted; there was no indication that his job would be eliminated during his absence, but that’s exactly how Aerol proceeded. – Above all, keep lines of communication open. Rodolfo gave 36 years to Aerol. He deserved consideration as he grew older, but he was not guaranteed a job. If and when any issues of his job performance arose, his supervisor should have sat down with him to discuss them openly. Ironically, there are no real winners in this situation: Aerol (or its insurer) took a big hit economically. They also lost a loyal employee who was still capable of making a positive contribution to the company. Rodolfo lost the job he loved and lived for. To be sure, he now has a nice nest egg for retirement, but that is not what he wanted most. He was one older worker who just wanted to keep on working. 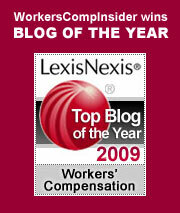 Posted in Best Practices, Business, Disability | Comments Off on Older Workers: How Old is Too Old? Predictive modeling has long been used in personal lines, especially auto insurance. It’s only in the last 8 or 9 years that we’ve seen it squeezing through the workers’ compensation front door in the areas of underwriting and claims administration. In this period, the major risk management consultants, TPAs and insurers have been developing sophisticated models to, in consultant-speak, “use advanced statistical techniques (e.g., multivariate analyses, generalized linear models) to simultaneously evaluate numerous potential explanatory risk factors for maximum amounts of knowledge from available data sources” (from a TowersPerrin 2006 paper) (PDF). To a certain degree, predictive modeling systems can suggest which injured workers are most at risk for staying out of work longer than is medically necessary. Predictive models use advanced statistical techniques to perform multivariate analyses that suggest the degree of risk associated with any one underwriting risk or any one injured worker claim. Some predictive models use hundreds, even thousands, of univariates, but, in the claims arena, as you can probably imagine, there are a limited number, perhaps 10 to 15, that are of most value, and many of these are of the common sense variety. For example, co-morbidities such as obesity, diabetes and diseases that affect oxygen intake, all of which hinder healing. Others are demographic, such as age, education, marital status and distance from the worksite. For example, if you have a 55-year old divorced Type-2 diabetic male who lives alone more than 20 miles from the worksite and who suffers a crushing injury to the foot you more than likely have an employee at high risk for extended absence. Of course, any claims adjuster worth his or her salt intuitively knows this, but a predictive modeling system can examine all of the appropriate variables and spit out a ranking with recommendations in a nanosecond or two. Predictive modeling doesn’t come cheap, and it doesn’t replace the experience and judgment of a seasoned claims specialist, but, if used wisely, it offers a significantly sharp, relatively new arrow in the claims quiver. “Used wisely” is the key phrase, because if that happens the claims adjuster can quickly link the at-risk injured worker with a clinician skilled in dealing with the bio-psychosocial risk factors associated with delayed recovery. In other words, the full-court claims press can be applied very early in the claims cycle. Add to this mix an educated employer injury coordinator who projects a caring and compassionate approach to injured workers and who offers a well-thought-out modified duty program, and the likelihood of successful return to work is increased substantially. The goal is to remove excuses for staying out of work longer than is medically necessary. This type of approach assures that injured workers, the vast majority of whom are motivated to return to productive lives as fast as possible, do so on the fast track. Even more important, those who are not so motivated, those with other agendas, are identified almost immediately. We recommend that you ask your insurer or TPA claims executives to explain their firm’s approach to and usage of predictive modeling. Employers should know to what degree and in what way their claims adjusters are using this tool.